Hello everyone! I am back with another review after a long time. I have heard about this KISS Skincare products from many bloggers' review but didn't have the chance to buy it since last time no one is selling it in Indonesia. And, now the product is a bomb in Indonesia and many people are using it. Finally, I had the chance to try and review this product sponsored by @KISSJakarta and @official_kissindo. 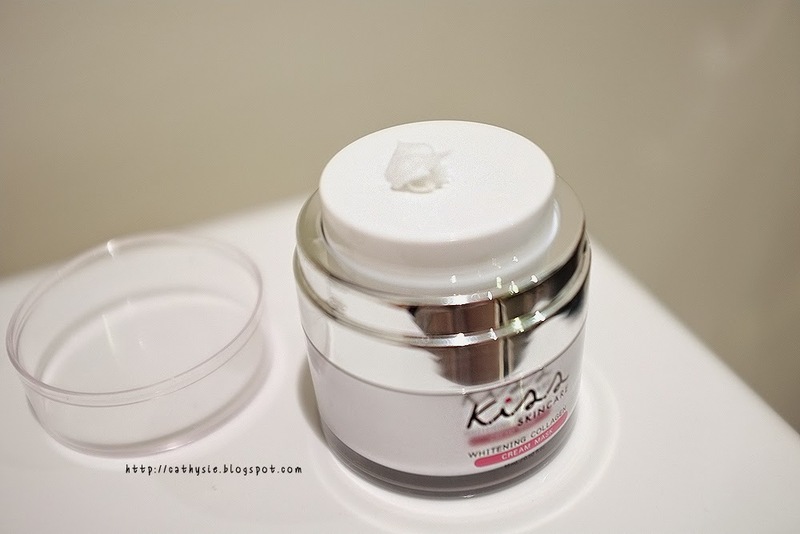 KISS Whitening Collagen Cream Mask is a famous product that comes from Thailand. This overnight collagen sleeping mask is made up of 100% all natural product with no trace of steroids nor mercury. It is suitable for any skin types and comes in two sizes, 15 ml and 30 ml. It is co-founded and recommended by Dr Atom of Atom Clinic in Thailand, a famous celebrity doctor known for his celebrity and supermodel clientèle. The back part of the box shows the description of the product, how to apply, manufactured by, and the ingredients they used. The product comes in a tiny glass bottle along with a cute pink and white colored box which for me look so pretty *_*. It has a vacuum cap container to keep the cream clean, away from all the dust around. Not only that, they also use a pumping method to pump the cream out. It is so easy to use and apply, not to mention hygienic also! This is my swatch for the product. It comes off with a white thick creamy cream with a really sweet smell. It blends well with my skin, you can see that there is no trace of it. I usually take 1.5-2 pumps for my face and neck. The amount of pumps depend on your face and neck, just remember to apply evenly! After using it on my face, I can feel that it's absorbing into my skin and leaving my skin with a moisturized feeling. I really like the design of the product and the smell. It is easy to apply also since they use a pump method. I can feel that my skin is becoming vibrant, even my sister was like asking "what did you use? your skin looks so clean and fresh". It restores radiance, clarity and suppleness of my skin. Not only that, it also minimizes my pores and smoothed my skin. I have a very dry skin and I always use a lot of moisturizers every morning and night(and yes, slapping my face with moisturizers for it to absorb lol). But because of KISS, instead of using moisturizers every day now I can just use KISS twice a week and my skin will look fresh and healthy. I really like the smell on my face. The packaging is so cute with pink and white color. Easy to use and apply with the pump method so you can measure the amount you want without wasting the product! Makes my skin look radiant, clean, fresh, and vibrant!